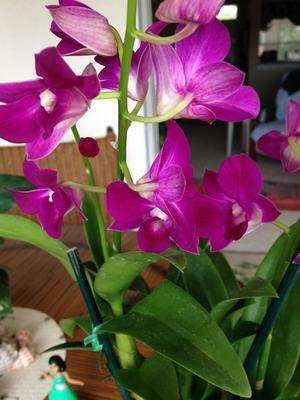 Hi, there - I purchased a dendrobium about a week ago, and I'm totally terrified of it. I have a couple of phals which seem to be doing well, so decided to try the den. But, I'm worried now that I'm not giving it the proper care. I have an east facing window, which does not get much light, due to the palms out front. My only other source of light is the lanai, which faces west (Sliding glass doors to the living room as well). I have the plants on a table on the lanai, which I move away from the screen as the sun comes over the top of the building, so they do not get direct sun. But, since dens apparently like more sun, am I doing the right thing? 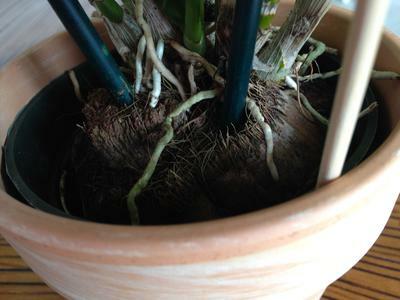 I've attached pics, one shows what the den is potted in (appears to be a piece of wood). Any advice would be appreciated; I am in love with this flower and want to do the right thing for it. It will appreciate fairly heavy watering during active growth. After it finishes flowering, you should reduce the water you give it until you see new growth starting at the base of the plant.